A multicultural spin on an old rhyme stops short of rehabilitating its problematic history. 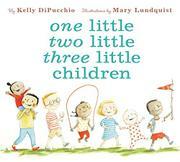 “One little, / two little, / three little children” is both the title and the first line of this picture book. The children depicted in the opening illustrations are a racially diverse group occupied in various activities. The rhyme then turns to depict “One loving, / two loving, / three loving daddies” and includes a picture of a two-dad family. Mommies come next, and then the focus shifts to houses. The first homes are in a bucolic, rural setting, and then a verso page shows an apartment building. Facing this page is a trio of homes: “Snow-cozy, / stick-cozy, / brick-cozy houses,” and herein lies the rub: the igloo and teepee depicted here are juxtaposed with a child making a structure of building blocks, undermining efforts at multicultural inclusion by falsely equating these so-called “snow” and “stick” structures with toys. These depictions also bring to the forefront the text’s similarities to versions of the rhyme referring to “One little, / two little, / three little Indians” that have been roundly critiqued as racist, or, even more egregiously, other versions that use the n-word. The appearance of another teepee on the outskirts of the closing illustration is perplexing—is it a plaything like the soccer goals? Or just a visual balance for the ice cream truck? Or something else?